Today I had the pleasure of interviewing Megan Maloy from Megan Maloy Photography a portrait and lifestyle photographer based in Jersey City, New Jersey. Megan has been in this industry for over 20 years and Her work has received countless awards and been commissioned for numerous well known clients and publications. She received a BFA in photography from School of Visual Arts in 1997. She is the photographer for this HGTV.com photoshoot from a Small Green Space featured in our prior posts. Megan, How did this beautiful photoshoot overlooking the New York City Skyline come about? I’ve been shooting photos for A Small Green Space since the beginning of their business. I usually photograph most of the spaces in which Emma has done a complete redesign. If you look at A Small Green Space website or Facebook page those are all my photographs. So when Emma asked me to photograph this space, of course I agreed. I always love working with her. I’m a freelance photographer based in Jersey City, NJ. I’ve been shooting for almost 20 years. I have a BFA in photography from School of Visual Arts. I shoot primarily portrait and lifestyle photography for a range of clients from editorial, to advertising, to stock photography. I also try to exhibit my work in galleries, when I have the opportunity. I have an exhibit up now that’s been shown in 2 locations in Jersey City. It’s a mix of landscapes from Iceland and contemporary dancers I shot for a local dance company. Over 20 years you have done so much from beautiful landscape shots to even celebrities, how has your work evolved? Yes, my work has evolved over the years. A lot of the change has come about because of my clients and the jobs they have hired me to shoot. Each job comes with different challenges. That’s one of the things I really like about what I do for a living. It’s great to get a request from a client for something a little new (or even not so little). While sometimes it can be stressful, I love the problem solving aspect. It’s rewarding to deliver a job that my clients are happy with. The challenge keeps me on my toes, keeps me from getting bored, keeps me learning, and evolving. Also, a lot of what I’ve shot for my clients are people or things I wouldn’t have had access to if it wasn’t for the job. It opens up a new world to me. Like I said earlier, I primarily shoot people, so working with A Small Green Space and photographing exterior spaces has been a nice change of pace for me. It has also helped me with the rest of my work. Being able to make beautiful photos of a space has helped elevate my portrait photography because I like to incorporate the environment as part of the portrait. I feel like it often helps to tell a story because the space can give the viewer a lot more to look at than just a face. Shooting for A Small Green Space has helped me to see a space differently and be more aware of the environment while I am shooting my portraits. You do all kinds of photography, what is your favorite kind personally? I love shooting quirky narrative portraits. When something is just a little “off”, or makes you think, or see someone or something in a new way. If I hear someone giggle when they look at one of my photos I’m really happy. I love what I do and if I can make other people happy with my photos then it’s a win all around. Sometimes life gets too serious and we all need to lighten up. Shooting some fun portraits helps me keep that in perspective. You seem to enjoy adapting to your subjects in an element of surprise and working around them vs staging. What do you look for in those moments? That’s exactly what I like to do when photographing portraits. I start with a pretty solid idea of who or what I want to photograph. I often brainstorm ahead of the shoot to come up with some concepts for inspiration, and ideas of what I want my photo to look like. Then when it comes time for the shoot, I use those ideas as my starting point, but then let the situation unfold naturally. It helps if I let go and just let my subject be themselves. What I am usually looking for is the moment when that person has let their guard down and is their true self. By being observant, I can find the moment I want. I start with an idea and then I let that idea go and leave it up to the moment. If I try to control the whole shoot and direct my subject too much, then the photos usually end up being a bit boring. Do physical differences in say shooting in Iceland vs New York City, force you to be different technically and how do the two change your personal process? The biggest difference in shooting some of my projects is whether I’m shooting for a client, or shooting for myself. Iceland, for example, was a personal project. I shot those photos because it was beautiful there and I loved every second of it. I shoot personal projects (for example photos of my daughter) just because I really love taking photos. When I’m taking those type of photos I usually just shoot in the moment and just enjoy it. When I’m shooting something personal I can make it look or feel however I want. When I’m shooting for a client, I have their end goal and needs in mind. I’m shooting for them. Even though they’ve hired me for my style of shooting, I still need to deliver what they need. When shooting for a client the photos need to be technically spot on and precisely composed. When shooting for myself I can loosen up a bit. That’s my work vs my art. Everyone these days seem focused on the technology of photography, what are your views on tech vs art? This is just my personal taste, but my favorite fine art photography always starts with a strong technological base. I think that you can be really creative and have wonderful ideas, but if you can’t pull them off technically, you are cheating yourself and your viewers. I find it really frustrating to see really poorly made art. It doesn’t have to be technically perfect- that can distract from the artistic aspect. But I think that often you need a strong foundation to start with. It just raises the level of the work- and why wouldn’t you want that? For example someone like Gregory Crewdson. There’s no way he could pull of that type of work if he didn’t know what he was doing technically. It just makes the work more impressive to me. What new projects are you looking to get into? I think I need to shoot some new quirky portraits. I don’t have a specific idea in mind. Just portraits. I’ve been thinking lately about how many really interesting people I know. I should take advantage of who and what I have access to, and start shooting and see where it takes me. Kind of in the same way I approach my portraits- come up with an idea and then see what I end up with. I’ve been shooting a lot for clients lately but not much for myself. All work and no play… I need to get a new project going. After all your years of experience in this industry, what are the important things amateur photographers should focus on? I think it’s important to come up with a strong voice. Find your voice and grow from there. Study what other photographers (past and present) are doing and learn what you like and don’t like about their work. Use that as inspiration, and then go out and create something from your own personal perspective. Show us something we’ve never seen before. Also, figure out what you love to shoot - that passion will show in your work. Lastly, keep in mind that in art there are no right or wrong answers, so just do what makes you happy. Zeke is not only camera ready, he’s just always ready! That boy has way too much energy. I always tell him that he’s lucky he’s handsome. Zeke is my second pit-bull I’ve had. My dog before him was named Tilly. She had a beautiful soul- a really loving dog. I photographed her a lot too. I love photographing any dogs- they all make me happy. Especially my crazy Zeke. One of the great things about a Sun Garden cantilever umbrella is it's customization and timeless design that matches any style and color of patio sets on the market. Recently, we noticed a trend in patio furniture design where people have been moving away from traditional colors such as white and bronze and towards a modern look with silver and black. While we continue to offer white and bronze painted frames for our models, we also offer brilliant black and silver paint finishes for our 13 foot curve frames as well. The size of our large 13 foot umbrellas are already a fashion statement piece for many customers backyards, and now even more so in beautiful black and silver hues. Inquire about a custom Umbrella for your backyard today! Today we had the pleasure of interviewing Emma Lam a Garden Designer and Horticulturist who owns A Small Green Space, which is a full-service urban landscape design/build/maintenance firm in the New York City Metro area. Emma’s training includes KLC School of Designs’ Garden Design course and a Certificate of Horticulture from the Brooklyn Botanic Garden. Tell me about A Small Green Space? I started A Small Green Space nine year ago in my hometown of Jersey City, NJ. We are a full service landscape Design/ Build and Maintenance company. We service the NJ/ NYC Metro area and focus on designing Residential Urban Spaces. Hence our name “A Small Green Space”... no suburban yards for us! How do you find the balance between style and functionality in a small space? Its often difficult. When we do our initial consultation with our clients we ask for their “wish list”. And a lot of times, people want and need their spaces to meet a variety of requirements: a play space; a comfortable entertaining space; space to BBQ and eat outside; an area for the dog to run around in etc. Meeting all of these needs at once can be tricky when you only have 500 square feet to work with. Therefore we rely on convertibility. A bench becomes a table; a artificial lawn doubles as a patio; a planter contains not only colorful flowers but also edibles; the space under the stairs to the deck becomes a playhouse; the roof of the shed becomes a green roof etc. As for the “style” part of your question, it is imperative for us to find attractive and useful outdoor accents. If you have only one love-seat in a space, it better be good looking! And preferably it is light weight enough to move out of the way when you need to set up a folding table for your 4 years old’s Birthday party. If you have an umbrella, and many roof decks and balconies are uninhabitable without them, it better look good; be easy to use; and do it’s job well! Is there a way to include all of the elements that you would find in a large outdoor space in the design of a small one? Yes, but on a different scale. You can not expect to have a formal Versailles style garden, but you can have accents of lavender and dwarf topiary boxwoods. You won’t necessarily have room for a swimming pool but you may be able to incorporate a cocktail pool. The key is to know your scale and work within it. As I mentioned earlier a small space can be multi-functional but this requires lots of creative thinking, detailed planning and knowledgable execution. How do you start your designs, is it based off of function or does it start around an element? It starts with our clients. Before we start working together, I meet with each of our clients in their spaces and run through a design brief with them. I ask lots of questions like: how do you envision using the space? Do you have any plants you like or don’t like? If you entertain outdoors how many people do you usually invite etc. Sometimes a client will show me an “object” that they want their space designed around. One client wanted to incorporate some old city cobblestones they had acquired when the streets of their youth were ripped up by the city. Another showed me a Japanese lantern that had been handed down in her husbands' family for generations. It’s wonderful to be shown an article that is important to a person. And it’s such an honor to be trusted with our clients stories and the mission to include them in our Designs. In your experience, what are unseen design issues that people should be aware of when working on their own outdoor spaces? Jumping to “install” without having a clear vision/ plan first. It is so easy to get excited and say “I have an outdoor space in the city! I’m going to put in a patio”! But how big is that patio? How big is your table that will go on the patio? How many people will sit at that table? Do you have enough area for grass? Plantings? You don’t have to hire a professional Designer to create a plan, but at least scratch something out on paper. Look on the internet or in books for images you like. Ask yourself questions about what you really want, need and what you can afford to spend. And then have fun! One tip I give clients with a brand new space is to take a chair, (even a folding chair will do), and move it out into the space. Then sit in it for a few minutes. Even if there is NOTHING else in the space, sit for while. Over the next week, move the chair around. See how it feels to sit in different areas: Are your neighbors viewing you from one corner? Is the sun to strong at the back of the space? Do you have to walk across the lawn to get to the chair? See how the chair looks from inside: Does it look inviting? Is it a focal point? In conclusion- I think people should spend a little time getting to know their spaces before they jump in and change them. What trends do you foresee coming in outdoor design? In urban outdoor design I think that small scale Green Roofs and Green Walls are going to become very popular. We installed a green roof on a shed this season. It is not only the view from our neighbors bedroom windows and roof deck but also from the upper floors of their neighbors spaces. And in the few short months since we installed it, it has flourished! We also installed a green wall on a free standing 5’ x 6' wall that we built to “define” a tiny lounge area within a small space. We LOVED doing the green wall and can’t wait to install more! Overall, Urban outdoor design is very popular. I not only work designing urban spaces, but I also live in the NYC Metro area. So I can attest that 15 years ago, a lot of urban back yards were overgrown, forgotten “storage” areas. When I started in the business it was me and push mower in the back of my Subaru. We now employee: two full time gardeners; 3 part time gardeners; 4 builders; 2 office assistants; a bookkeeper and Design Assistant. A lot of people want outdoor “living” rooms these days and they are looking for Designers to help create them. What does a cantilever umbrella add to design vs a regular patio umbrella? Well first of all they are beautiful! Umbrella’s are often a huge (and necessary) focal point in a small space. And unfortunately standard yard umbrellas are very unattractive. Sadly they are not very useful, unless you are sitting directly underneath them when the sun is directly over-head. And finally they are often dangerous in a city space. We work on a lot of roof decks and balconies and almost all of them experience EXTREMELY high winds. Before meeting us, one of our clients had an umbrella fly off of their 19 floor roof deck down to the street below! Thank goodness no-one was hurt, but after that they wanted to be sure that their shade solution (which was extremely necessary due to the intense sun on the roof deck) was secure. The cantilever umbrella is beautiful and sturdy. The base is solid and can be weighted for extra security. And because the angle of the large umbrella can be adjusted, it gives ample shade wherever and whenever is needed. 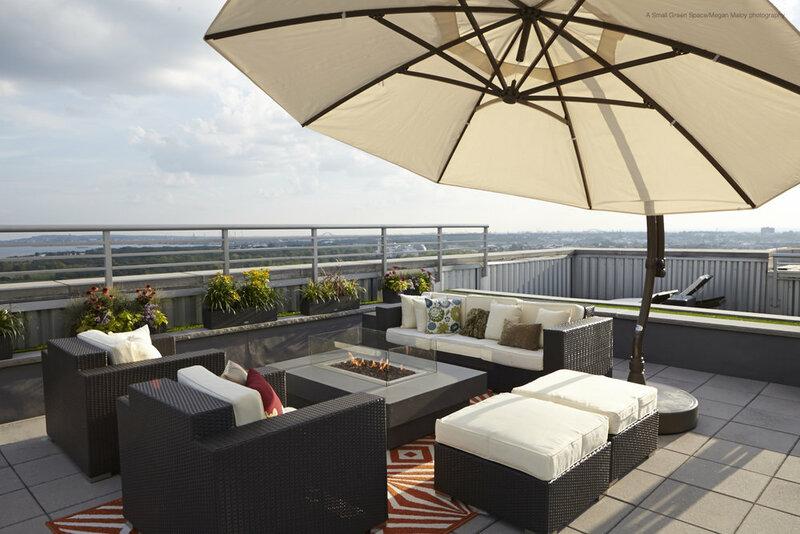 What should someone look for when they are searching for outdoor furniture? For small spaces they should look for appropriately sized furniture, that is weather hardy for their specific environment and is light weight enough to be moved around the space somewhat easily. They should also make sure to measure their spaces. Both the space the furniture is to “sit” on and also the access ways to get to the space (doorways, stairways and elevators etc.). This will ensure that they can get the pieces into their space and have room enough for them once there! If someone wanted consulting on an outdoor design, how does that process work? First they reach out to us and set up an initial consultation in their space. At the consultation we will run through the design brief mentioned above and also explain our Design service in more detail. After all your years of experience in this industry, what should people focus on? Making a space they will love and not a space that they think they should have. If you are in a city, remember that your outdoor space is another room. It’s an opportunity to have an outdoor “living” room… so go ahead and live in it! Sun Garden USA Takes Casual Market Chicago on Twitter!